What is there to ‘copy’? As we all know by now, the Mercedes system works by diverting high pressure air, when the DRS is operated by the driver, through a channel in the rear wing endplates. It’s ducted along pipe-work to the nose, down the front wing mounting pylons, and out of a series of holes set along the underside of the main-plane of wing spans. The outcome of this system is that while the DRS is activated, the redirected air stalls the front wing, preventing it from generating as much down-force, and so reducing drag – less drag ultimately means higher speeds at the end of the straights. It also has an advantage around corners that the drivers want to run the DRS through (during Quali) – reducing the down-force that is being generated from both wings (rather than just one) produces a more balanced car, and should make it nicer / easier / faster to drive around certain corners on the track (in theory). The Mercedes system is a very neat use of the loophole that they discovered, but it does look like it might be slightly conservative – I’m guessing that they didn’t want to design something that was so vital to their car setup, handling and concept, that if it had been thrown out within the first few weeks, their season would’ve been ruined from the start. Additionally, it is only functional when the DRS is open, so it’s major advantage come Qualifying, but not as much throughout the race. Many teams’ names have been banded about as to which ones might be working on their own update. Typically those names that we hear loudest are the ones with the most money and resources. Red Bull always do well in having tricks on their cars – as we’ve seen from the number of ideas that they’ve had to remove, not to mention the ones that just haven’t been found yet. Adrian Newey probably has in his head the best way in which to create a new device to assist the car, but we’ve not seen it yet – either he’s saving it for next season, or he’s sulking that he didn’t think of doing something like this first. It’s surprised me that we’ve not seen anything from McLaren either. They have definitely been working on things back at the McLaren Technology Centre (which does look like a secret lair), and Martin Whitmarsh declared cryptically that: “We are not announcing when, where and if we are going to be introducing it”. Ferrari are the other front-running team that I would expect to have tried things to improve their car, but I think that is the exact reason they’ve not yet – they need to actually make their car ‘driveable’ (for Felipe – as Fernando seems to be able to drive anything right now), and it looks like they have just about reached that point. No disrespect to any of the midfield or smaller teams, but the only other team that I was expecting to come up with something was Lotus. Their car has looked very competitive, and I didn’t anticipate them going down this route. But now they have, I’m eagerly awaiting the weekend where they run it in the race – Kimi would have to be a favourite on that day. There was plenty of speculation by the wider F1 community as to what the system should actually be called: Double-DRS, D-DRS, Super-DRS, F-Duct-DRS, to name just a few. Lotus have come out and confirmed that James Allison calls it The Device, but otherwise they’re sticking to the DDRS name – which I dispute, but we’ll get to that. When it was first revealed, there were a plethora of different ideas coming from around the paddock as to how it actually worked. Let’s start with what we could see: 2 new inlets (1) set back from the engine air intake at the roll hoop – looking like a pair of little ears when viewed from the front; a ‘snorkel’ (2) running from in line with the rear bodywork up to beneath the rear wing; an enhanced duct (3) taking flow from the cooling outlet on the back of the engine cover and out above the beam wing (4) and underneath a redesigned monkey-seat (5). It’s important to note that this system was either going to be activated either by the DRS, or it could be created so that it is operated passively – i.e. would utilise a fluid-switch, so that a change in air-pressure through the system would ‘turn it on’. To start with I thought it was working in a similar style to the Mercedes system and was triggered by the activation of the DRS. It looked like air might flow down the ‘snorkel’ and redirect the regular flow (red path) away from the monkey seat and down (yellow path) towards the diffuser, blowing through the starter hole. It looked like they were creating a system that would add downforce without increasing drag, (à la the Exhaust Blown Diffuser), thus allowing them to run with the DRS open through more marginal corners. It wouldn’t correct for balance quite like the Mercedes system, but it would mean faster lap times were possible. It turns out this was wrong, the yellow path doesn’t exist – it’s not there. I had similar thoughts about it stalling the regular flow over the beam-wing to reduce drag, but that turned out to be erroneous as well. It has since become apparent that instead of air flowing down the snorkel, it in fact flows upwards. The system has been tuned (somehow) so that when the Lotuses are travelling at a certain speed, air is diverted from its usual path up the snorkel to stall the rear wing – the idea behind the McLaren F-Duct from 2010 (so named because of the location of the intake duct – on the 'f' of Vodafone). This system has a much wider scope for giving cars an advantage, and I expect this one to be copied by other teams sooner than later. The biggest difference between the Mercedes DDRS and the Lotus solution is that Lotus do not use the DRS to trigger the activation of their system – which is the reason I dispute the name – it doesn’t involve the DRS. 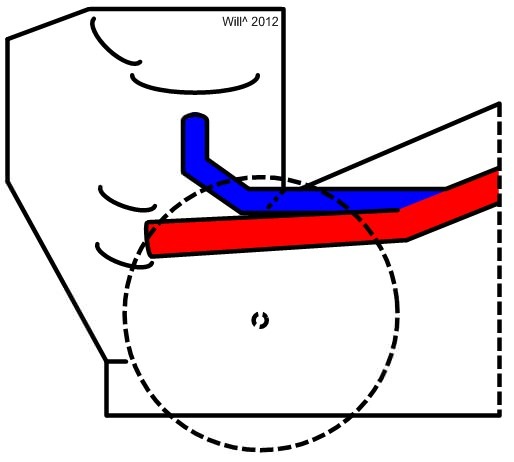 Instead it provides a degree of stalling while the DRS is closed – meaning it can shed drag not just during Quali, but also throughout the duration of the whole race (regardless of DRS activation) and through parts of certain tracks where DRS is banned – like the recent Eau Rouge in Spa, or the Tunnel in Monaco (if they had developed the system by that point in the season) – something that is limited on the Mercedes’ DDRS. This system has a much wider scope for giving cars an advantage, and I expect this one to be copied by other teams sooner than later. As there are no longer allowed to be any movable aerodynamic devices, which the driver now ‘counts’ as – for the purpose of precluding the F-Duct, the Lotus system has been tuned so that it only begins operating at a certain speed (which will definitely remain a secret, unless Lewis Hamilton becomes part of the team). As for how the tuning actually works I have no clue – something to do with air-switches and differing pressures at different speeds. Because it’s a relative of the McLaren system, I’d want to call it another F-Duct or go 50-50 and call it the F-DRS. If Lotus manage to get enough reliable running in dry practice sessions, we might actually see their DDRS (to use their name for it) in a race. But have they been delayed so much that other teams have caught up? It has to be noted that in Spa, Marussia were supposedly running a snorkel similar to the Lotus solution in Spa during FP1/2, but the rain meant that we didn’t get to see it – either on TV or though any of the photographers’ lenses (the ones that I’ve scoured). Respect has to go to these guys for trying to put it on their car – with their limited budget and resources; who cares if it’s pretty much a copy of Lotus? It’s the best solution so far! During the FP1/2 sessions on the Friday morning at Monza, it was spotted the McLaren rear wing had some suspicious tubing running down its endplate. It looks more like tubing for pressure sensors, held on with aeroplane-tape. They didn’t run anything new at any point of the weekend, but it looks like they have been collecting data in that area of the car, with the view to possibly bringing a gadget of their own to the closing races. Also in Spa, Mercedes were also spotted testing in FP1/2 a similar snorkel, in addition to their DDRS. Does this mean they’re looking at running a triple-DRS before the end of the season? The answer to that appears to be yes; at the recent Young Drivers’ Test, we’ve been able to see the team testing updates that should help the car for the remainder of the season. In addition to a new McLaren-style ‘coandă-effect’-exhaust, we saw the reappearance of their Lotus-style update. The team ran it on the car on the first and third day of the test at Magny Cours. It looks like it contains a fluid-switch and so is activated in a similar way to the Lotus system. The difference comes where the ‘snorkel’ reaches up to the rear wing; the Mercedes design does not touch the wing, rather it blows up onto the underside of it, but the benefits would be similar. The F1 teams have already voted to outlaw Double-DRS for next season – more specifically systems that utilise the DRS to activate a secondary device. That means the original Mercedes system would be banned, but the Lotus would remain legal. There seems to be no intention or effort made to rule this one out, so we can expect there to be a plethora of devices on the cars next season – that is if they don’t appear in Free Practice sessions for testing towards the end of this season.